Stem cells transmit a vast potential for treating disease but they also come with hurdles that must be overcome to ensure their success and viability for treating disease. One challenging area is that involving a patient's immune system. The challenges are also unusual because they mostly pertain to embryonic stem cells whereas adult stem cells can actually alleviate immunological challenges that tend to accompany embryonic stem cells. It's important to understand what exactly happens during immune rejection before looking at the different immunological consequences from use of embryonic stem cells. Embryonic stem cells hold enormous potential and benefit for treating disease because they have the ability to differentiate into virtually any tissue in the human body. This means that if scientists can learn to successfully and safely control and regulate their growth, the unspecialized embryonic stem cells can be coaxed to differentiate into specialized cells for almost any tissue in a patient's body. The problem is that the transplanted cells will likely be recognized as foreign and a person's immune system will reject the potentially lifesaving treatment. By utilizing treatment with immunosuppressive drugs, the reaction can be reduced but if the response is already mounted, the drugs will not eliminate the body's attack. A problem with immunosuppressive drugs, however, is that they essentially wipe out a patient's immune system and thus, leave the patient highly vulnerable to infection. Any microscopic diseases in the stem cells or surrounding environment can more easily harm the patient. Adult stem cells offer a way to overcome the immunological challenges associated with embryonic stem cells. The approach to avoid an immune rejection is to provide a perfect match between a donor and recipient. If the match is similar, a person may still need to remain on immunosuppressive drugs for a lifetime to prevent rejection. 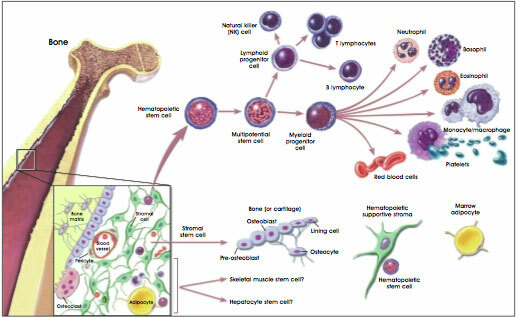 Adult stem cells utilize a person's own cells, which are isolated from tissues, triggered to multiply in culture, and then transplanted back into the patient. This type of therapy thus avoids the immunological challenges of embryonic stem cell therapy although adult stem cells do not multiply as readily in comparison with embryonic stem cells.